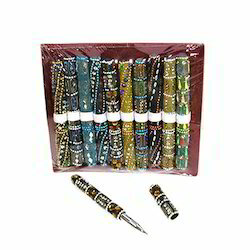 Hand Decorated Pens - Set of 12 (comes without cap also). Being a customer oriented enterprise, we are engaged in providing a wide array of Glass Pen. Offered in various specifications, these pens are acclaimed by our clients, owing to their smooth writing, optimum durability and leak-proof feature. 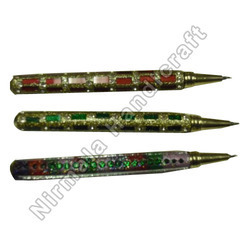 These are beautifully designed with glitters of beautiful colors that are designed to give them an appealing look. Owing to our proficiency in this domain, we are providing our clients an optimum range of Decorative Pen. Lac Decorative Pens have a 10 colors in different design. use in office and home. for more design and pattern please contact us. We Are Mainly Looking Queries from East Europe, East Asia, Central America, North Africa, Australia/NZ & South East.